Due to an error, season 2 is in fact season 1, season 3 is season 2, etc. The current season is displayed as season 26, but it is only the 25th season of competition. Belgium is one of the biggest countries in Hattrick. The first season, which was called season two (because there was an error in season one that caused the league to be created without any teams in it) started on the first of January 2002. This happened after Pelotas, a user formerly playing in the USA, had asked for a separate league to be created for Belgium. Belgium hosted World Cup XI. In February 2005 around 4200 Belgian users voted in a country name poll. 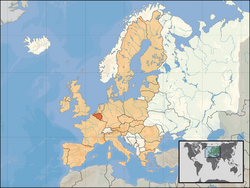 Most of the voters wanted to keep België as the country name. 57% wanted to keep it as the drop down menu name, and 60% wanted it as the full name. Other choises where Belgique and Belgium. On the 16th of October 2009 the name was changed from België to Belgium anyway. België won the first EuroCup tournament. FC Holcim won the Hattrick Masters XIV in season 41. Due to an error, season 1 is called season 2, season 2 is called season 3, etc. BelRank - Statistics for all Belgian teams, including division IX. Hattrick.2link - Belgian page with a collection of interesting HT-links. ^ Koninklijke Heusden-Zolder was renamed to Koninklijke Beringen Heusden-Zolder SK. ^ The team was renamed from FC Nieuwmoer to Nieuwmoer Football Club and finally to Nieuwmoer FC. ^ huuubs was renamed to Asgniegoespult Draf. This page was last edited on 29 September 2017, at 20:42.